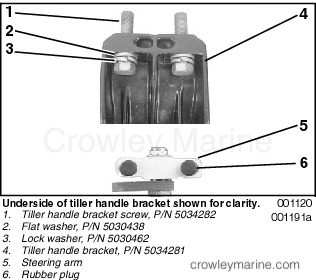 For installation of Tiller Handle Kit on 90 and 115 HP Johnson 4 - Stroke Outboards. This kit is ONLY for use on 90 and 115 HP 4 Stroke outboards. Do not install on 140 HP 4 Stoke models or any other models. 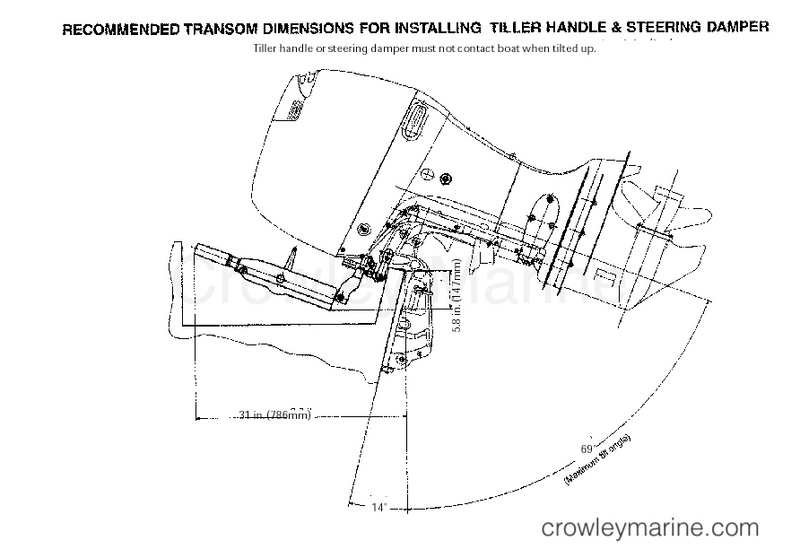 Install both tiller handle assembly and steering damper assembly as a set. A See Part Manual P/N 5033321 for detailed part listing. Only shift the engine while at idle RPM. 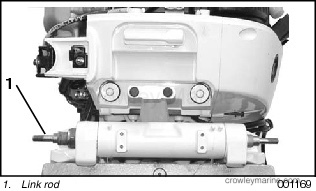 The tiller handle features a mechanical system that will not allow the engine to be shifted into gear above idle. If the shift into gear is accomplished at a high rate of speed, the RPM limit will be released and the resulting sudden acceleration could injure boat occupants and bystanders. A boat designed for remote steering might have a lower maximum rated horsepower for a tiller-steered outboard than shown on the certification plate. To avoid overpowering a boat designed and rated for remote steering, contact the boat manufacturer for the tiller steered maximum rated horsepower. To prevent accidental starting while servicing, disconnect battery leads from the battery. Twist and remove all spark plug leads. Avoid damaging the tiller handle when tilting the motor up. Position the motor to clear obstacles in the motor well and boat. Grease link rod with Triple-Guard® grease and slide into tilt tube. Place flat washer and rubber washer on starboard end of link rod. Place flat washer, spacer, and rubber washer on port end of link rod. Install link arm on starboard end of rod as shown. Temporarily fasten arm to rod with flat washer and locknut. Temporarily fasten other link arm to port end of steering damper assembly with flat washer and locknut. Grease shoulder of drag link bolt with Triple Guard grease. Install two bushings in drag link hole. 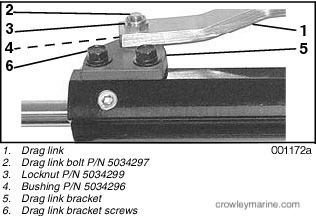 Fasten drag link to bracket using bolt and locknut. Torque drag link bolt to locknut 24.3 ft. lb. (33 Nm). 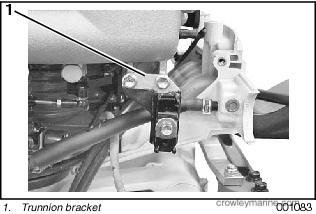 Fasten drag link bracket and drag link to cylinder assembly using two screws. Apply Nut Lock™ and torque 88.5 to 142 in. lb. (10 to 16 Nm). 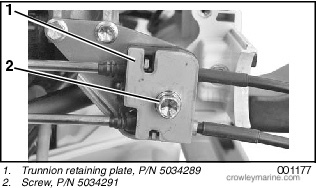 Insert the starboard end of steering damper plunger rod into starboard link arm, inserting port link arm onto rod at the same time. Using flat washers and locknuts, temporarily fasten port link arm and starboard link arm. Place bushing in drag link hole with flange facing steering arm. Grease shoulder of drag link bolt with Triple Guard grease. Install bolt in drag link through bushing and thread bolt into steering arm rear hole as shown. Thread bolt until drag link is against steering arm. Temporarily tighten the washer and nut to the bolt. 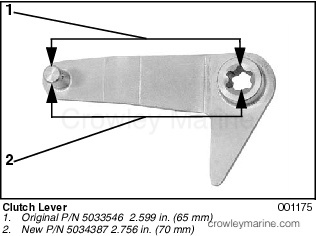 Torque four starboard and port link arm locknuts to 24.3 ft. lb. (33 Nm). Torque drag link bolt and locknut to 24.3 ft. lb. (33 Nm). Never reuse the locknut after it has been threaded into position and torqued. After initial use, the locking ability of the nut is diminished. A reused locknut could loosen resulting in a loss of steering control and creating a risk of personal injury or property damage. 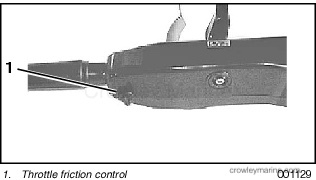 The steering damping force can be adjusted by turning the knob on the steering damper. Turning clockwise: Increases damping force. 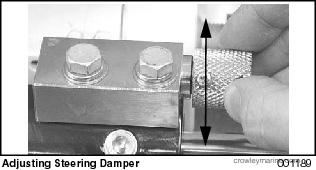 Turning counterclockwise: Decreases damping force. Adjustable range of steering damper is five turns. Do not turn past locked position as the damper may not function properly, creating a risk of personal injury. Remove the lower port/starboard engine covers . 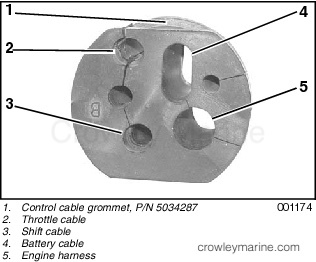 Remove control cable grommet. 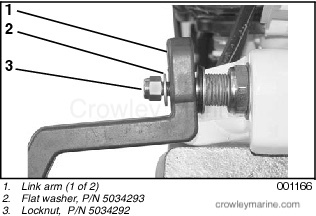 Place split lock washers and flat washers on tiller handle bracket screws. 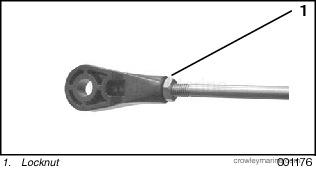 Remove rubber plugs from threaded holes in steering arm. 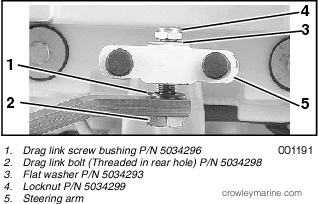 Apply Nut Lock to threads of screws and fasten tiller handle bracket to steering arm. Torque screws 62.7 ft. lb. (85 Nm). 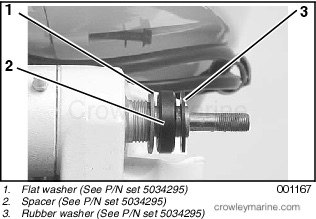 Assemble the flat washer, two spring washers, flat washer and spacer, in this order to the pivot bolt. Apply Triple Guard grease to tiller arm pivot bushings and install in tiller handle. 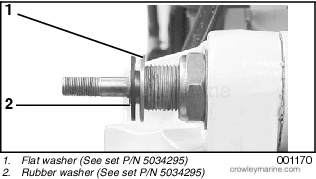 Apply Nut Lock to threads of tiller arm pivot bolt. Align tiller arm pivot bolt with tiller handle hole and insert pivot bolt with assembled hardware. 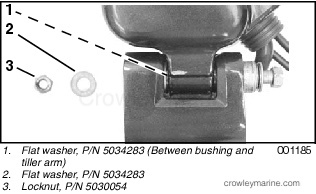 Apply Triple Guard grease to flat washer and place in between bushing and tiller bracket as shown. Torque tiller arm pivot bolt to 18.4 ft. lb. (25 Nm). Install flat washer and locknut to pivot bolt. While holding screw torque locknut to 33 ft. lb. (45 Nm). Remove two screws, trunnion bracket and trunnion retainer. Install new trunnion bracket. Apply Nut Lock to the screws removed from old bracket and torque 70 to 106 in. lb. (8 to 12 Nm). Remove the E-ring. 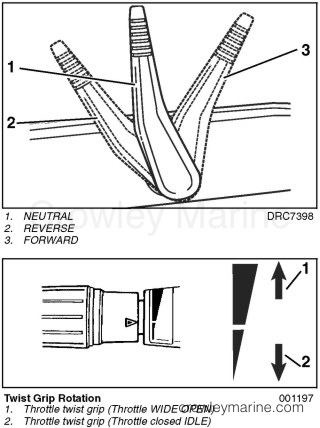 Remove clutch lever by sliding the shaft downwards. Install new clutch lever in same spline position as original lever and fasten with existing E-ring. IMPORTANT: Clutch levers have different dimensions and should not be interchanged. Install control cables, electrical harness and battery cables into control cable grommet as shown. 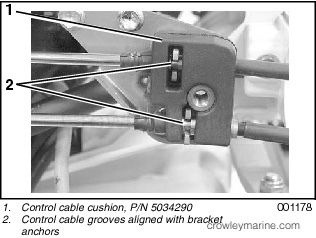 Install control cables through control cable cushion, aligning groove in cables with the slots in the cushion. Align cable grooves and cushion slots onto trunnion bracket as shown. Fasten trunnion retaining plate to trunnion bracket. Apply Nut Lock and torque screw 13 to 15 ft. lb. (18 to 20 Nm). Cable connector and locknut must be threaded at least 0.3 in. (8 mm) onto cable. 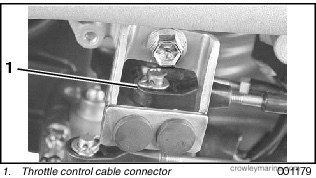 A risk of personal injury or property damage from loss of boat control could occur if cable connector unthreads from cable. Thread control cable connector onto shift control cable until threads end. Position engine clutch lever to shift gearcase NEUTRAL. Position shift lever on tiller handle to NEUTRAL. With gearcase, clutch lever, and shift lever on tiller handle in NEUTRAL position, adjust (thread) cable connector to align with clutch lever pivot pin. Fit the connector to the pivot pin with flat side facing clutch lever. 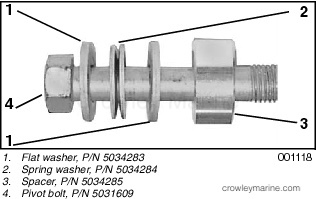 Install connector to pivot pin and fasten with flat washer and lock pin. Prevent injury from contact with rotating propeller; remove propeller before servicing and when running the outboard on a flushing attachment. Shift tiller handle shift lever FORWARD, REVERSE, and back to NEUTRAL to verify complete gear engagement and disengagement. It may be necessary to manually turn propshaft to ease shifting. Tighten cable locknut against the connector. 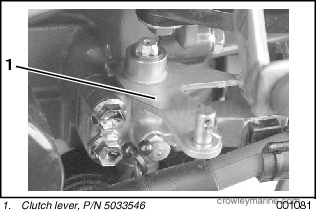 Position engine throttle lever to complete closed throttle plate position (IDLE). Rotate twist grip until it stops at full IDLE position. Thread control cable connector onto throttle control cable until threads end. Adjust throttle cable connector to align with thottle lever pivot pin. Fit the connector to the pivot pin with flat side facing down. Rotate twist grip until it stops at WIDE OPEN position to verify full throttle plate opening. 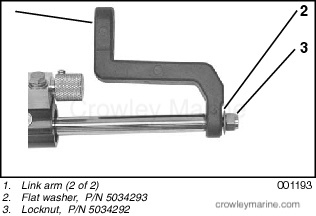 Rotate twist grip to IDLE to verify full throttle plate closing. Readjust as needed. 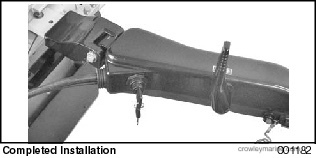 Attach three engine harness electrical connectors to mating tiller handle electrical connectors. Position harness to avoid any damage or moving parts. Use tie strap to retain battery cable, wire harness, and control cables together. Install the port lower engine cover. Align cover grommet in starboard lower cover and install lower cover. Check steering for full unrestricted movement to port and starboard. 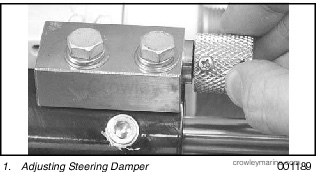 Check steering damping force adjustment to confirm steering is steady and smooth. Confirm normal engine operation while underway. Confirm the following are in proper operation before returning motor to customer. Engine starting/stopping with key switch. Engine stopping using emergency switch and lanyard. Steering movement and damper control. 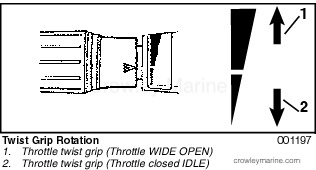 Throttle control (IDLE to WIDE OPEN). Shift control and proper gear engagement. Trim and tilt control using switch. Most operating and safety instructions for this tiller-steered outboard remain unchanged from the information in the Operators Guide for your outboard. Some differences are noted as follows. The emergency stop switch on the tiller handle replaces the one on the instrument panel or remote control. The lanyard clip must be on the stop switch to start the outboard. Turn key to OFF position or pull lanyard clip off stop switch to stop outboard. IMPORTANT: Attach lanyard securely to clothing or life jacket. 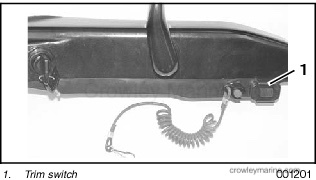 If operator is thrown from boat, lanyard will pull clip off stop switch, preventing boat from becoming a runaway. 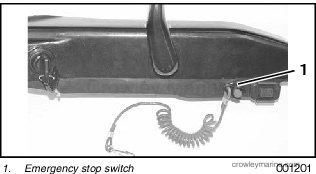 IMPORTANT: An extra clip is provided for the emergency stop switch. 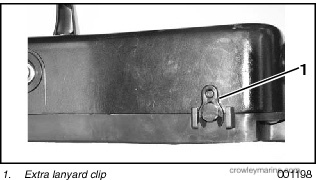 This clip should be attached to the key with an easily removed hook, or stored in a readily available location. If operator is thrown from boat, pulling lanyard and clip off stop switch and stopping outboard, a passenger can insert extra clip on the tiller stop switch and restart outboard. At lease one passenger should know location of extra clip and be familiar with this emergency starting procedure. 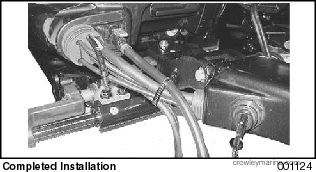 Some electrical current is used when engine is not running and key switch is left in ON position. If engine is stopped by pulling lanyard and clip off the emergency stop switch, turn key switch to OFF position to prevent battery discharge. Pull shift handle forward to shift outboard into FORWARD gear. Push shift handle aft to shift outboard into REVERSE gear. NEUTRAL is a detent position between FORWARD and REVERSE. Do not shift into gear unless outboard is running. When starting, turn throttle grip to closed position and move shift lever to NEUTRAL position before turning key switch to START position. When shifting from NEUTRAL into either gear, turn throttle grip to closed-throttle position, and allow RPM to drop to IDLE speed before shifting briskly and fully into gear. Then open throttle as required. When shifting from one gear to the other, turn throttle grip to closed-throttle position, and allow RPM to drop to IDLE speed, shift to NEUTRAL and pause, and then move shift lever briskly and fully into gear. Tiller-steered outboards have quicker steering response than remote-steered outboards. Avoid high speeds, quick turns, and demanding situations until you become familiar with the handling characteristics of your boat/motor combination. IMPORTANT: Maintain firm grip on tiller handle when accelerating and decelerating and when changing trim position so steering torque does not pull tiller out of your grip. 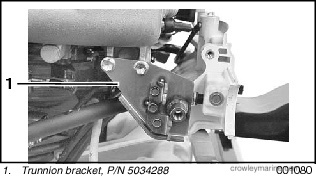 Change trim angle of outboard with trim switch to reduce steering torque on tiller handle when running at other-than-normal load or speed — for which trim tab has been adjusted. 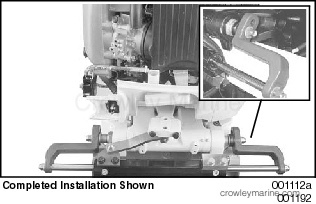 Throttle friction screw should be adjusted so that only a slight drag is felt when turning throttle. Do not overtighten. Never tighten steering damper to allow “handsoff” steering. Control would be more difficult in an emergency, and you might not be able to avoid an accident. If you install an System Check® gauge or System Check tachometer/gauge, you will need a Horn Kit, P/N 176361, and a Cable, P/N 176382, to connect the outboard to the gauge. Disconnect battery cable before working on electrical wiring to avoid accidental cranking or chance of shock or burn injury. 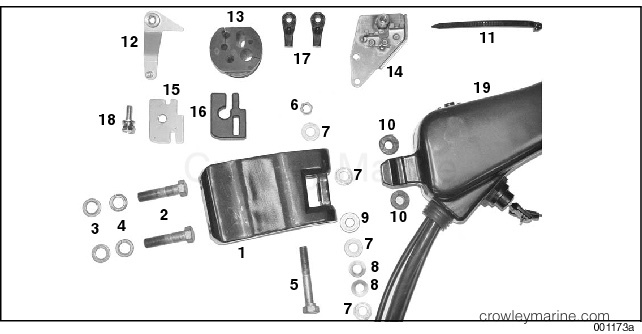 Connect cable to warning horn, tachometer/ gauge, and engine wiring harness. 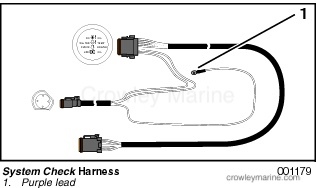 The cable’s purple lead must be connected to any boat harness battery positive terminal. If your outboard is not equipped with an System Check engine monitor or System Check tachometer/ engine monitor, an engine malfunction will cause the tiller handle horn to sound and/or cause other engine response. When you turn the key ON, the horn will sound a 2-second test beep. If you hear a series of short 0.2-second beeps while the engine is running, it is the self-diagnostic system indicating that a control sensor or control switch has failed or is out-or-range. After a fault code is set, each time the key switch is turned ON, the horn sounds the test beep, and then sounds and repeats a pattern of beeps that is the fault code. This code will be used by your dealer to locate and correct the problem. See your dealer. If one of the following abnormalities occurs while running, the engine will sound a series of long (1 1/2 second) beeps. If you hear a series of long beeps, and / or the engine slows to 3000 RPM, (and you are not running higher than the normal RPM range), you must take immediate steps to determine if the problem is either low oil pressure or overheat and correct it. Check the water pump indicator for a steady stream of water. If not a full stream or stream is intermittent, see Engine Overheat. If pump indicator stream is OK, STOP ENGINE. See, Low Oil Pressure. PROBLEM: Engine oil pressure below 14 PSI. Engine will slow to 3000 RPM (if over 3000 RPM when low pressure occurs), and may shake noticeably. Warning horn sounds a series of long (1 1/2 second) beeps. Stop engine. Check oil level with dipstick. Add oil if low. Check for oil leaks. Fix leak. Warning resets when: Oil pressure is over 14 PSI and engine is below 3000 RPM. PROBLEM: Engine temperature too high or heating up very rapidly. Engine will slow to 3000 RPM (if over 3000 RPM when overheat occurs), and may shake noticeably. Check water pump indicator for a steady stream of water. If pump indicator stream is intermittent or is not a full stream, tilt DOWN, trim IN if mounted high on transom and/or is tilted UP in shallow-water position. Verify that water inlet is submerged. If pump indicator stream is intermittent or is not a full stream, idle engine, shift to REVERSE and operate at fast idle for 10 seconds, then shift to NEUTRAL. If water intake is cleared and pump indicator stream is restored, run at fast idle until engine cools. If pump indicator stream is not restored, stop engine, tilt UP and clear water intake of debris. Tilt engine DOWN, restart, and recheck if pump indicator stream is restored. Run at fast idle until engine cools. Warning resets when: Engine cools to normal temperature range. If overheat indication remains, see your dealer. PROBLEM: Engine RPM over 6500. Engine will slow to 3000 RPM, and may shake noticeably. Check if lighter than normal load. Check prop for weeds or trash. Check for worn prop blades or prop loose on hub. Warning resets when: Engine is stopped or engine is reduced below 3000 RPM for 1 second. PROBLEM: If battery voltage drops below 9 volts for 30 seconds. Do not use any high-amperage devices. Turn off any unnecessary electrical devices. Check battery electrolyte level. Check 30- amp fuse. Check battery switch position if accessory battery is used. Warning resets when: Voltage increases over 9 volts. If indication remains, see your dealer.